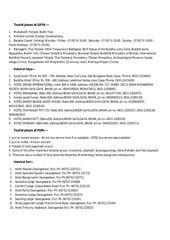 This PDF 1.5 document has been generated by Microsoft® Office Word 2007 / Microsoft® Office Word 2007; modified using iText® 5.1.3 ©2000-2011 1T3XT BVBA, and has been sent on pdf-archive.com on 24/10/2016 at 12:41, from IP address 117.248.x.x. The current document download page has been viewed 562 times. Hindus, Muslims, and Christians without having statutory ownership certificates are 320, 44, and 63 respectively. 349 of these elephants are Tuskers, 74 Female elephants and 4 are Male elephants without tusks. This file has been shared by a user of PDF Archive. Document ID: 00498641.